Home » The Howling Dervishes. Wandering round Scutari, one afternoon, I quite unexpectedly came across the Teke, or Mosque, of the Howling Dervishes, and it being one of their holy days permission was readily granted on payment of a few piastres to enter. It is quite an unpretentious building, situated on the outskirts of Scutari, not far from the great cemetery. Its interior presents a long room, or hall, with a gallery running round three sides, the space beneath being divided from the floor of the central part by a balustrade; this portion is devoted to visitors. On the occasion of my visit i occupied a seat in the gallery, from whence a better view of the ceremonial is obtained. At one end of the hall is seen a recess; it is the Mihrab. Here, on a stand, is a copy of the Koran. Above this is an inscription in large gold characters, which I afterwards learn is the name of the founder of this sect— Ahmed Rufai. Around the walls hang implements of torture of most forbidding appearance, daggers and spears, axes, knives, and many other curious weapons; and on the front of the gallery are suspended tambourines, cymbals, and other musical instruments, which, from their dusty and discoloured appearance, have evidently not been used for some considerable time. The congregation of the Faithful are quickly arriving and taking up their places in the central part of the building. They are not all dressed as dervishes; many are in ordinary attire, and some are in naval and military uniform. The service began soon after my arrival. The chief having taken up his position in front of the Mihrab, and each of the arrivals having saluted him, the service commences with a low chant, the worshippers kneeling the while and going through the several positions required by their ritual. When the prayers are finished,one of the attendants folds up all the rugs and prayer- carpets, leaving the central space clear. The whole of the devotees are now standing around, forming a semicircle. 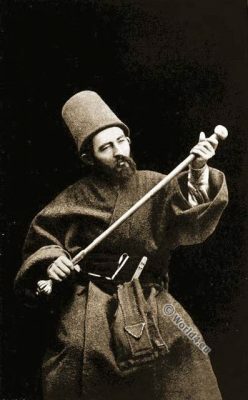 An elderly dervish, with rather a powerful voice, and who is seated on the floor, leads off a chant, accompanied by a performer on a small native violin. They all now begin to shout in chorus together, “Allah! Allah! Hou! Hou!” with other words accompanying each cry. Then they all join hands and sway together, shoulder to shoulder, now sideways, now forwards, now backwards. The cry, or shout, at first is subdued, but it soon increases in force and energy; their movements are quicker, they become heated, perspiration streams from them. An attendant goes round the circle with linen caps for such as cast off their felt head-coverings or fezzes. Then they begin to throw off their garments, for the exercise is becoming fast and furious. Many by this time are stripped to the waist,not stopping for a moment from their swaying, and shouting “Allah, ilah! Allah, ilah, Allah!” and an exclamation, all in unison, which sounded in my ears very like “I feel very ill, O Lord! I feel very ill,O Lord!” with a strong emphasis on the last word. This goes on without intermission for nearly an hour, the leader of the ceremonies keeping up the excitement by shouting, clapping his hands, and exclaiming, “Go on! go on! keep it going,” &_., till at length, fairly worn out by excitement and exertion, one after another falls out of the ranks, and there is then a pause for a time. The chief again takes up a position in front of the Mihrab, and begins the ceremony of healing the sick and blessing the children. The sick and the lame are placed by an attendant, in turn, flat on the floor, face downwards, the Sheik standing for a second or two on each patient. Strange to say, although the pressure must be considerable on the tender forms of the little children, I heard no cries or murmurs. The patients rise beaming with satisfaction, but the lame, when they begin to move, still limp, and the fever of the sick child still burns in its eyes. They all go away hopeful, however, after this simple performance of the dervish Sheik—and, surely, after all, there is a good deal in faith. At its conclusion,bottles containing water and dishes with food (perhaps for those who were sick) were brought and were blessed by the Sheik, who seemed to repeat a short prayer and to blow over each. They were then handed back to their owners, supposed to be endowed with healing virtue. The devotees, being rested by this time, are again ready to commence. They join hands once more, and, shoulder to shoulder, in almost a compact mass,begin again swaying from side to side and shouting as with one voice, “Allah! Allah! Hou! Hou!” the leader doing his best to work them up to a high state of excitement and frenzy. He shouts,and they, all in chorus and in harsh and hoarse voices, cry “Allah! Allah!” but it is extremely difficult to make out the cry, or what they are shouting. Perspiration streams from them, forming quite a dampness on the floor, as they now in double-quick time sway from side to side in one compact mass of humanity, groaning, and fiercely repeating their cry of “Allah! Allah! Hou! Hou!” Some fall out in convrions, their limbs contorted and their faces deadly pale. Attendants quickly remove them to a recess, where they are attended to by the chief, who, by blowing on them, soon restores them to consciousness. At last the ceremonies are over, having lasted for more than two hours. I felt most interested, and, as I walked along the cool highway, could not help reflecting on the devotion and strange fanaticism I had just witnessed. Source: Life on the Bosphorus. Doings in the city of the Sultan. Turkey, past and present, including chronicles of the Caliphs from Mahomet to Abdul Hamid II. by William J. J. Spry. Published: London H. S. Nichols 1895. Tags: Muslim ascetic orders. Ecstatic Dances. Rifāʿīyah. 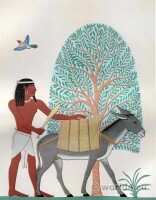 Ṣūfīs. Sufismus. Whirling & Howling Dervishes of Turkey & Syria, Tariqah. Arab man with shell hat. José Tapiro y Baro. Jewish maid of Algiers costume. Camels Resting in the Sherkiyeh. Land of Goshen.